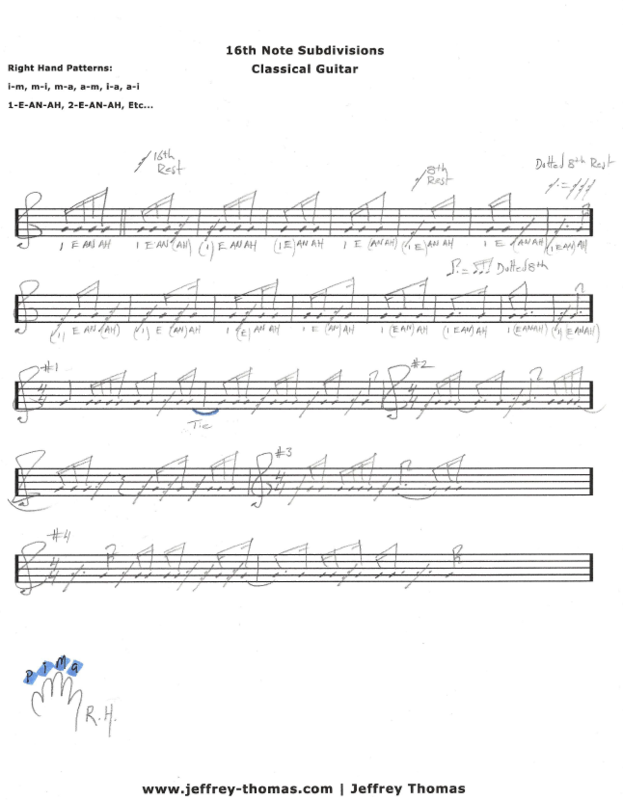 16th Notes For Classical Guitar by Jeffrey Thomas. Improve your classical or fingerstyle guitar playing with my detailed video guitar lesson and notation explaining 16th note counting or “Rhythmic Code” played slowly with a metronome, multiple right hand finger combinations are designed to create balance of tone and strength for fingerstyle guitar playing. A great lesson for learning to count 16th notes while developing right hand technique. Want the guitar tab for free? Just send in your email address using the form provided. Looking for online classical guitar lessons? Fill out the Schedule A Free Lesson form to set up your free Skype guitar lesson today. I hope you enjoyed learning from the free video lesson on 16th notes for classical guitar. You will find more free guitar tabs on my tab, video and blog pages.